Audi S3 1.8T 2003 (ME 7.5). •All four individual wheels speed from stock ABS into MaxxECU traction system. •Instrument cluster (speed, tacho, CEL, odometer etc) working. •Stock ESP button can be used to activate/deactivate MaxxECU built in traction system, uses stock light on dash for confirmation. •Fuel consumption in instrument cluster. •VCDS diagnostics with ECU is disabled. •Smoother speedometer output in dash in MTune 1.121. •Audi A4 (EU spec), (ECU number 8E0 909 518 AS/0261 208 500) <-- AC fan might not work, under investigation. 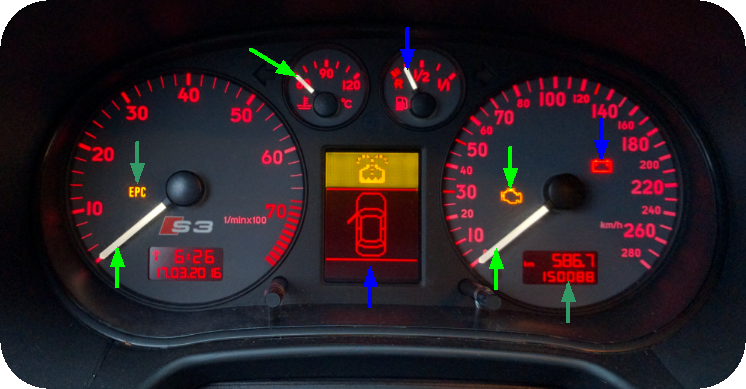 Note: Audi S4 B5 must enable this protocol to get dash / abs to work properly, refers to ECUs ending with D,H,G,M. Green (dark): Working (but not controlled by CAN). Orange: Partly controlled by MaxxECU.